The Rule referred to by Simon Mason in commentary is Rule 9.10. 9.10 Players must not approach within 5 metres of an opponent receiving a falling raised ball until it has been received, controlled and is on the ground. The initial receiver has a right to the ball. If it is not clear which player is the initial receiver, the player of the team which raised the ball must allow the opponent to receive it. He correctly states that ‘the 5m Rule’ is the only consideration (to determine the legitimacy of the goal). The umpire refers to the video umpire but his only question is “Was the ball played by the stick of the attacker”. Does the Explanation of Rule application change anything in this scenario? i.e. was there a clear initial receiver and if so, who was it? Clearly the goalkeeper is the initial receiver, at the time the ball was deflected upwards off the defending CAN player, the ENG player was considerably more than 5m from the place the ball fell and the goalkeeper was within 1m of it. Therefore there was an encroaching offence by the ENG player. Why was the Rule ignored and a goal awarded? 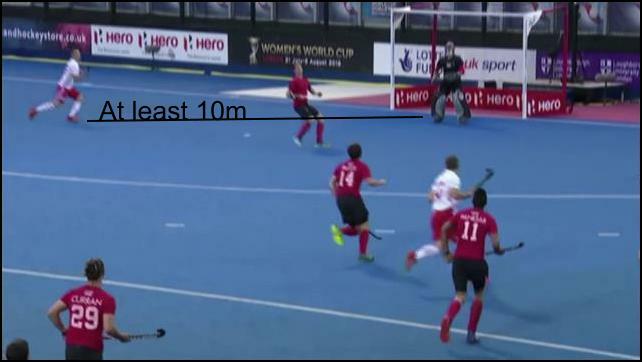 There has been mention elsewhere of the guidance from the FIH Umpiring Committee given via an Interpretation of a video presented on the Dartfish website. The GER player passes the ball up the pitch. In trying to intercept the pass the ENG player deflects the ball high into his own 23 metre area. The ball is going to land between an ENG defender and a GER forward, potentially leading to dangerous play. A free hit is awarded to GER where the danger was created since the ENG defender did not give the GER forward the opportunity to receive the ball. But this interpretation is not relevant to the CAN v ENG incident because in the GER v ENG match shown on Dartfish the ball falls between two opposing players who were already within 5m of each other when the ball was deflected upwards. This encroaching offence below from AUS v BEL is more like the incident in the CAN v ENG match. I suggest that because of the swing at the ball by the AUS player in the above video, besides there being an encroaching offence there was also other dangerous play. So two deliberate offences – and a yellow card should have been given. The ENG player in the CAN v ENG match does not play at the ball in a way that could have endangered the goalkeeper – but that, because of the prior encroaching offence, is irrelevant. Neither of the two incidents referred to above in support of the Rule occur in the circle – and it has to be conceded that a ball that is falling into the goalmouth after a deflection off a defender creates problems that a ball falling considerably more than 5m from the goal-line (outside a circle) is unlikely to cause. No goalkeeper or any other defender can be reasonably expected to allow an attacker receiving the ball off a defensive deflection falling within 5m of the goal-line to receive and control the ball to ground without contest: it might be considered unreasonable to demand such compliance if the ball is falling anywhere within the circle. An attacker within 5m of the goal-line and under a falling ball is moreover extremely unlikely to attempt to control the ball to ground – a volley shot of some description is far more likely. For a Rule to demand that a defender allow 5m of space is unreasonable (perhaps even impossible) and grossly unfair in these circumstances and no Rule should be either unreasonable or unfair. to what it was previously:- 9.8 Players must not play the ball dangerously or in a way which is likely to lead to dangerous play. 9.8 Players must not play the ball dangerously or in a way that leads to or is likely to lead to dangerous play. A deflection leading or likely to lead to dangerous play is then an offence and a free ball (or a penalty corner for a deflection within the circle – although a restart on the 23m line would be fairer) may be awarded. The umpiring in the opening video is more erosion and an absence of common sense. The umpire may not have been aware of the attacker’s position when the ball was raised if he was following the play directly in front of him. This is the first thing the video umpire should have looked at and it should have been the umpire’s first question. It was after all the first thing that occurred to the commentators and something both umpires needed to be certain about to make a sensible recommendation and decision. Where there is no video available, the trailing umpire, being in these situations in a position to see both the deflector and the attackers at the same time, should be consulted. Stills from the video show that the ENG player was at least 10m from the goal at the time of the deflection and that he could not have been unaware that he would commit an encroaching offence. The action sequence at the tail end of the video indicates that the umpire should have been more aware of the ENG player’s position. The ball was put up in front of the umpire’s position and slightly to his right, the same direction as the approaching attacker, but watching for two things (at different levels) at the same time when both are moving is never easy. An example of umpire ‘brain fade’ he allowed the encroaching offence, which he must have seen, to fade from consciousness because he focused instead on whether or not the ball had touched the stick of the attacker – which in the circumstances was irrelevant – that the ball was contested for at all was an offence, in fact it was an offence for the attacker to have moved to be within 5m of the goalkeeper. I am again reminded that when the Offside Rule was finally deleted in 1997 the then Hockey Rules Board undertook to put in place measures to constrain the behaviour of attackers in front of the goal. Neither the HRB or the renamed FIH Rules Committee have done anything of the sort. Clarity about dealing with a deflection falling into the goalmouth would be one step in the right direction. The nonsence (which appears to have been ‘born’ on an Internet hockey forum, due to the persistence of one individual) that a deflection should not be treated as a falling ball under the terms of Rule 9.10 needs ‘kicking into touch’ once and for all.